If one of your establishments has suffered damage from a natural disaster or is undergoing some kind of major renovation, you may be wondering how this will affect your business. This can be a stressful time for business owners and employees alike so it’s recommended that you attempt to alleviate the uncertainty as soon as possible. One of the ways you can do this is by working with a business that specialises in temporary structures. Temporary structures are semi-permanent solutions that you can take advantage of when your business finds itself without a location to operate in. It’s the ideal way to help prevent any disruption or losses of income that would normally occur during this period, and it can be fully dismantled when you decide you’re ready to return to your original location. 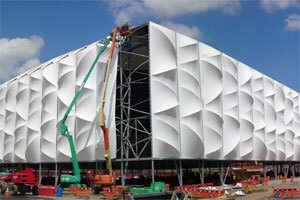 Companies like Neptunus specialise in building temporary solutions for events, retail stores, and even supermarkets. The structure can be used for anywhere between just a few months or several years depending on your requirements. You’ll also have the option of hiring, purchasing, or leasing the structure so that you’re only paying for the building when you need it. Temporary structures are created using a fully modular building system which not only means they can be created quickly, but that they’re also fully customisable to your company’s needs. This modular design works around flexible dimensions and offers a variety of options regarding climate control, insulation, and sanitary facilities to fit a range of different business types. Construction can also incorporate the appearance and notable characteristics of your brand as well as the staple features of your other establishments so don’t have to worry about your day-to-day experiences being compromised. Working with temporary structures providers also helps eliminate a lot of the risks associated with expanding your business. If you have established your company in an area and you don’t see any more potential for growth, you could consider using this situation as an opportunity to test out a new location. If you decide to this, however, it’s important that you take the time to research the location in detail. You need to factor in if there are any similar businesses to yours operating in the area, what products or services they offer, and if your company could improve or differentiate from these. While experimenting with a new location is a risk, the potential gains could be numerous and may end up improving your company in the long-term. A successful company makes the best out the situation at any given time. Temporary structures can allow your business to do the same at a time when you thought you were at your most vulnerable.